Tired of nuisance moles in your area? Use our nationwide directory of wildlife control operators to locate a professional trapper near you. 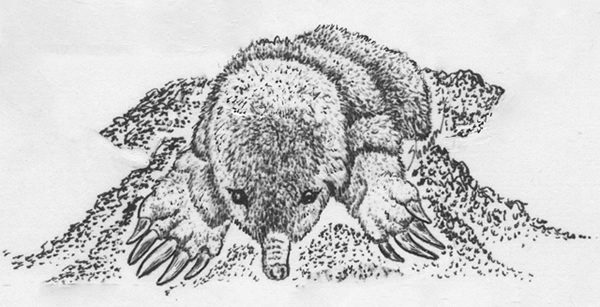 Moles are strange creatures; odd in appearance, reclusive, and living their entire lives almost completely underground. Their unusual feet make them instantly identifiable, as do their tiny eyes. Living underground as they do, their eyes are seldom needed and are almost non-functional, sometimes even covered with fur. 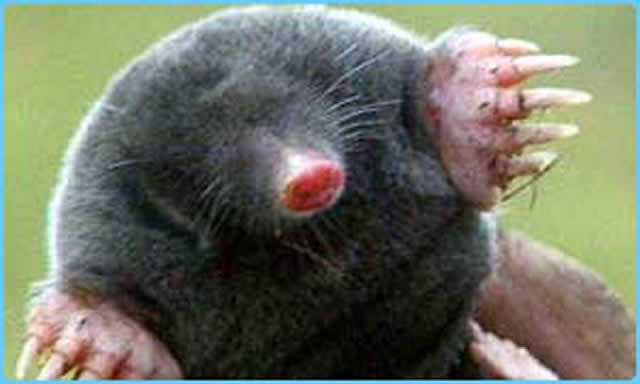 It is a common mistake to see a ground mole and think that it has no eyes at all! 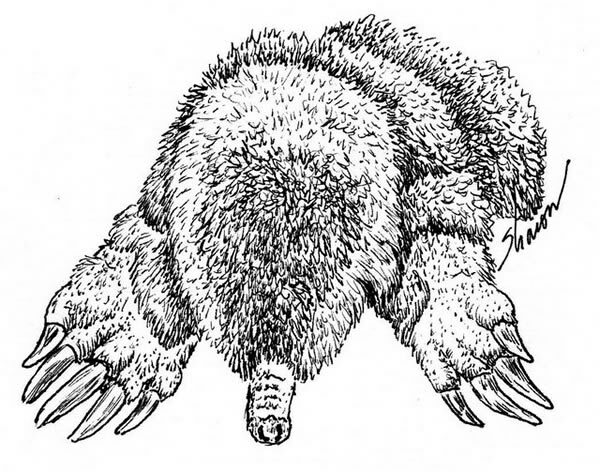 Mole activities can be a terrible nuisance to people. If you have one living underneath your lawn, you may be wondering why, oh why, did this creature have to choose my yard to make its home? And who can I call for mole removal? What makes some places more attractive to moles than another? These animals typically make their home burrows in high, dry spots. When hunting, they prefer to soil that is shaded, cool, and moist. Parks and lawns that are well watered are appealing hunting grounds because of plentiful worms and grubs and easy digging. They often make their dens under large trees, buildings and sidewalks. Anyplace well populated by worms, grubs, and beetle larvae makes good hunting ground for hungry moles. To schedule an inspection, call Allstate Mole Control: 1-888-488-7720. 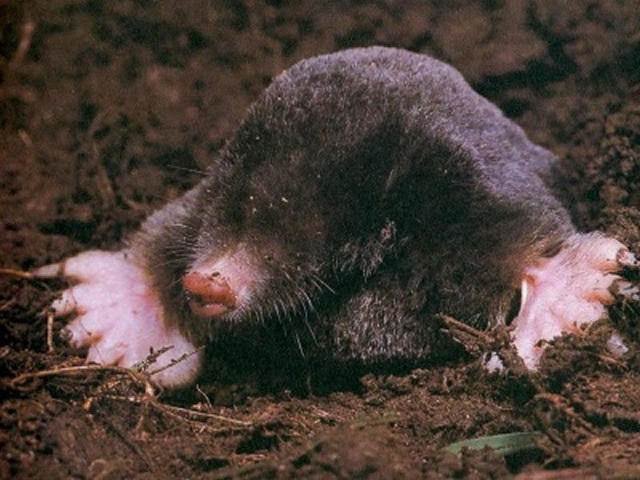 Moles do not eat grass, leaves, roots, flower bulbs or any other vegetation. However, they do great damage to lawn, landscaping and golf courses by tunneling which destroys plant root systems. They also leave their telltale hills everywhere they go. Their hills are easily identifiable by their shape, which is conical like a volcano. They also leave ridged tunnels all over. Having a terrible time with a burrowing animal in and around the edges of our yard. Over the last year we've lost two trees from damage to the roots. The other damages are volcano shaped dirt mounds that I have been told by local longtime residents are the result of moles. I have used a repellent product which is 100% castor oil which supposedly repels the animals by the smell of the oil. Also tried the sonic sticks and liquid fence, flooding holes, smoke bombs, nothing seems to work. We have two small Yorkie dogs and I'm afraid to use poison to kill moles. I would like to get rid of them before spring so that I can replant the yard and have healthy grass for the summer. I would like to do some planting of flowers and I want to feel safe that they are not going to ruin everything I plant. I have never seen anything so I'm assuming they do their digging at night. Why are ground moles a problem? These critters are fast and strong-- they can tunnel approximately 18 feet in one hour. Their presence invites voles and mice, which like to inhabit the underground tunnels they create. Although they don't eat plants, their tunneling can damage or kill vegetation and root systems. Moles do not pose any serious threat to human health through disease transmission or attack. When one comes around, it is usually not ever even seen; all that is seen is the evidence that it is there, such as molehills and ridged tunnels. The problem could be considered superficial, but can be quite annoying and cause for mole extermination. If the problem expands to include mice and voles, the infestation becomes much more serious. The one thing in their favor is that they eat grubs, which are harmful to lawns. Everyone would want a mole if we could only figure out a way to curb the destructive tunneling, but keep the grub-hunting. Ground Mole removal servicesA professional wildlife removal operator will usually get rid of ground moles by utilizing mole traps. Trapping is the most effective away we know to control these animals. There are two mole poisons available which are federally registered, and we also have mole repellents, but repellents are less effective. You may send us 5 to 10 digital pictures of your mole problem and we will give you a FREE cost estimate over the phone. For fastest services, call us today at 1-888-488-7720. Prices will vary depending on the severity of the problem and on the time spent on the job. Wild animals can be unpredictable. Every infestation is unique and our solution will be custom fit to your situation. Check with your insurance for coverage. Read more at our Mole FAQ. We also offer expert coaching services for a fee, so you can do the job yourself. We can even ship the necessary traps and products to you. We accept Visa and MasterCard. We also take purchase orders and cash. Begin mole control as soon as you think you have a problem. Our experts can help you get rid of moles before the damage gets worse.